Superstar singer Olivia Newton-John—best remembered for her role in the hit movie Grease—has been forced to postpone tour dates this summer because of some bad health news. But what she’s doing about it could inspire you, if you’re struggling with breast cancer. First diagnosed with breast cancer in 1992, Newton-John is no stranger to the devastating effects of the disease. But, she beat it back then using a holistic approach with complementary therapy. And she’s feeling optimistic about taking down the disease once again. A recent medical review published in April suggests that some of those treatments have plenty of evidence to support their efficacy in aiding breast cancer patients in recovery. When she experienced back pain earlier this year, Newton-John didn’t think it was a big deal. But, as it turned out, the cancer had come back and spread to her sacrum. (That’s the triangular bone in your lower back situated between your hipbones and pelvis). 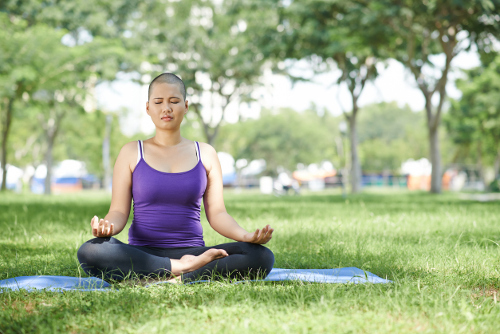 New research published in CA: A Cancer Journal for Clinicians, a journal published by the American Cancer Society, shows that certain mind-body alternative therapies are effective in aiding some of the symptoms of breast cancer. It should be noted that these are suggested complementary therapies and not replacement or primary therapies. They can treat symptoms associated with regular, or “Western medicine,” treatments. The use of music therapy, meditation, stress management, and yoga was effective for anxiety and stress reduction. The use of meditation, relaxation, yoga, massage, and music therapy could help with depression and mood disorders. Meditation and yoga could improve quality of life. Acupuncture and acupressure could help reduce chemotherapy-induced nausea and vomiting. There was a lack of strong evidence supporting the use of ingested dietary supplements or botanical natural products as part of supportive care and/or to manage breast cancer treatment-related side effects. So if you’re fighting breast cancer, these alternative therapies, when used with drugs prescribed by your doctor, could help ease the symptoms associated with breast cancer recovery. They will not kill cancer, but they may help you get through your recuperation period and keep these devastating symptoms at bay. “Growing body of evidence supports use of mind-body therapies in breast cancer treatment,” ScienceDaily, April 24, 2017; https://www.sciencedaily.com/releases/2017/04/170424110707.htm, last accessed June 5, 2017. D’Zurilla, C., “Olivia Newton-John has a new cancer diagnosis; her June shows are postponed,” Los Angeles Times, May 30, 2017; http://www.latimes.com/entertainment/la-et-entertainment-news-updates-may-olivia-newton-john-has-new-cancer-1496171885-htmlstory.html, last accessed June 5, 2017.